Finally Finches at Feeder Watercolor Sketch – Let's Paint Nature! 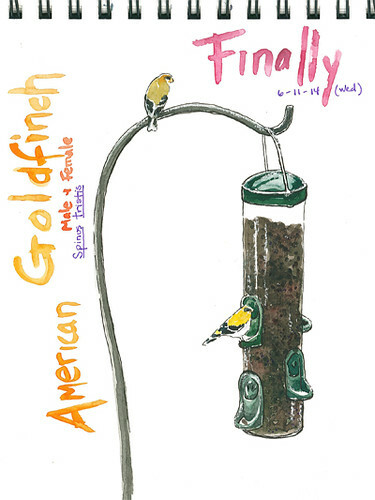 After hanging the feeder at my new residence and watching not one single guest partake for 4 WEEKS….finally….a pair of American Goldfinches happily dine and I in the window, happily watch with a big silly grin from ear to ear. So I start to wonder. How does a bird find a new feeder? By sight? By smell? And why does it take so long? Welcome friends. I’ve waited patiently. No not really, ha ha ha! Now go tell your friends where to get a good meal. (your photo) + (your GOLDEN magic) = WOW!!! 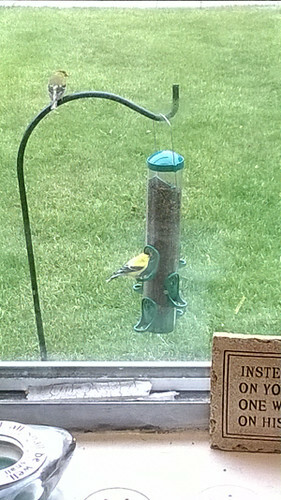 How appropriate that your first birdy visitors were Goldfinches. Of course, they and Mother Nature were leaving a commentary on your GOLDEN magic. I had planned for my next purchases: a bird-seed feeder and a hummingbird feeder. And I’ve learned from you that I have to be prepared to wait a while for my fine feathered friends to show up, and then to chirp chirp to all their good friends about where the new goodies are. I hope you get a flock of new visitors to your feeders. Have patience! It’s worth the wait and it feels soooooo good to provide for them. I’m sure they’ll tell their friends! Bolingbrook finches are fussy! I’m putting a sign on my feeder and sending them to your house. Hahahaha! I’ll take those birdies! No, seriously, you’ll get some. I’m sure they’re having a feast while you’re at work!